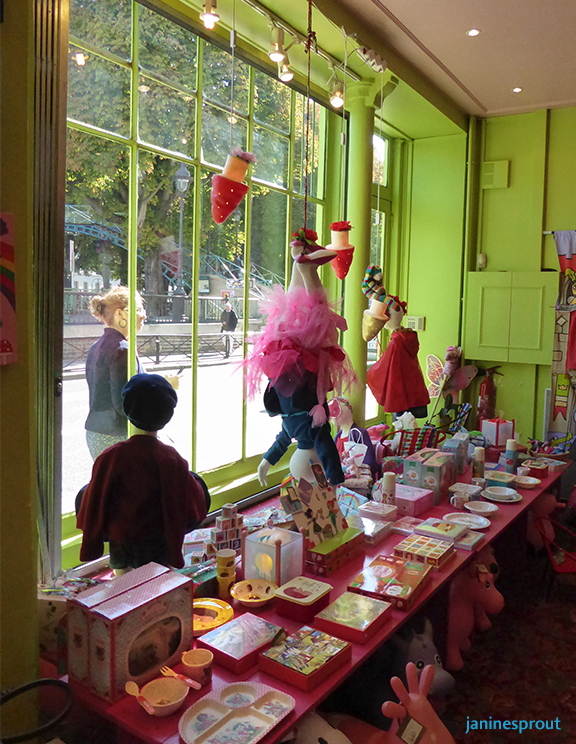 Smiling head to toe, ear to ear, am I after a visit to the 3 Antoine et Lili stores on the Quai de Valmy. 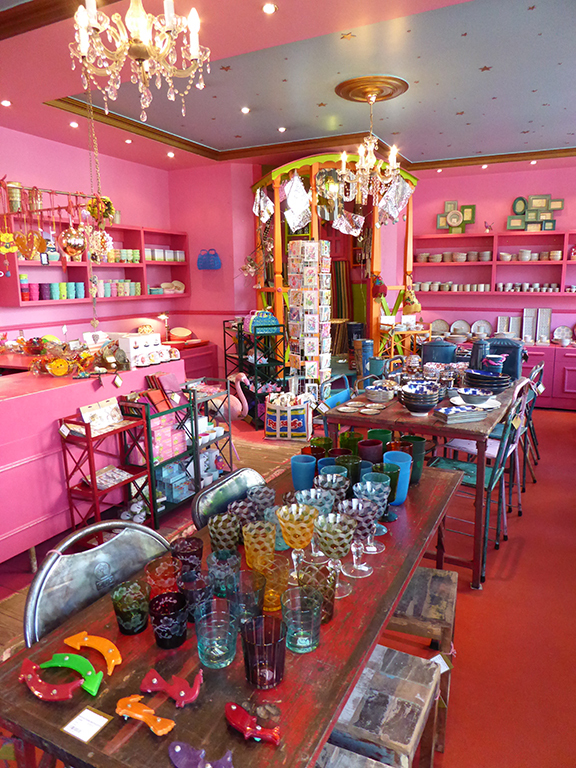 It’s not just the colorful goods they sell, it’s the ambiance, the feeling you get just being in the boutiques. The staff is incredible and I spent time with some of the managers who, in French and English, gave me a run down of their concept and management styles. I began my journey in the children’s (apple green exterior) store which is sandwiched between the other two and was met by Alice who said her name suited her. She had just finished the window treatment and explained her interpretation of Alice in Wonderland a la A&L. Alice was upside down (of course) in a pink tutu and all the other characters were in logical order surrounding her. The window radiated gaity, jubilation, esprit. 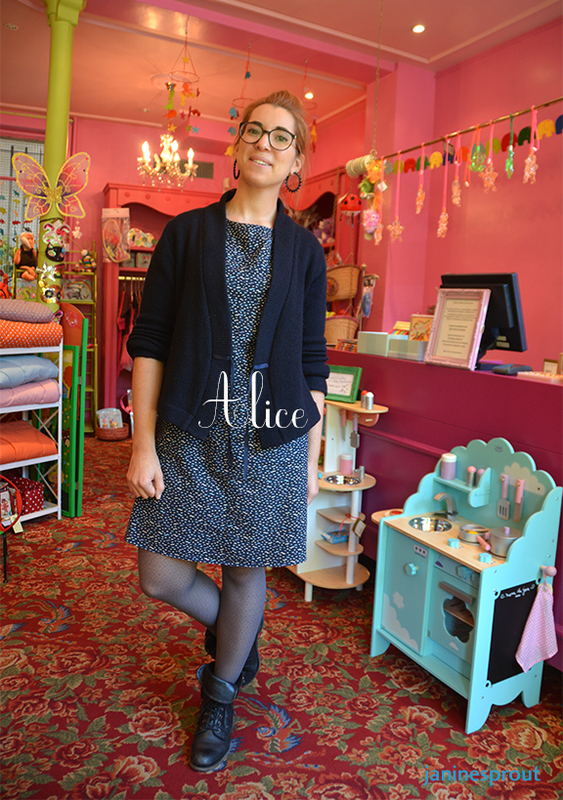 Alice said this was her arrangement of the week and what she loved about being manager of this boutique. 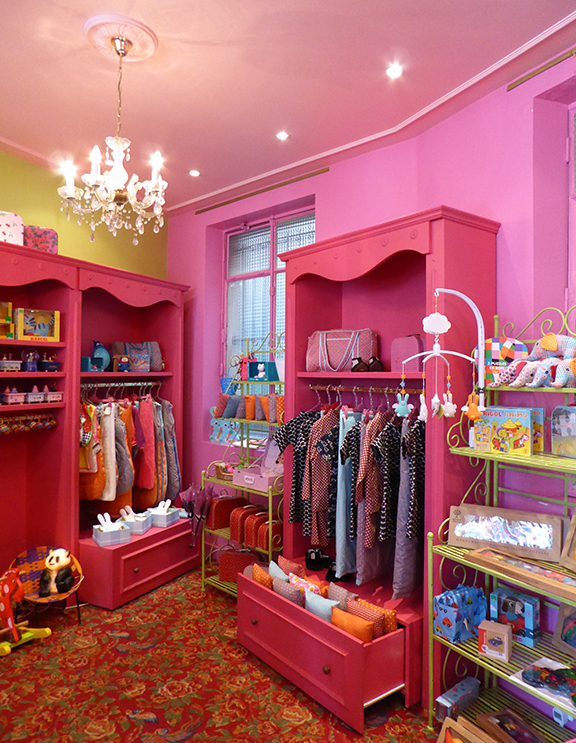 Sweet kids clothes, were A&L color palette arranged, toys and books in the mix. Prices very reasonable. Next door, along the Canal St. Martin, 10th arr. is their women’s clothing store, pastel lavender exterior. Walk in and your eyes will “pop” dazzled in floor-to-ceiling color. Signature A&L dresses, sweaters, hats, shoes, jewelry. 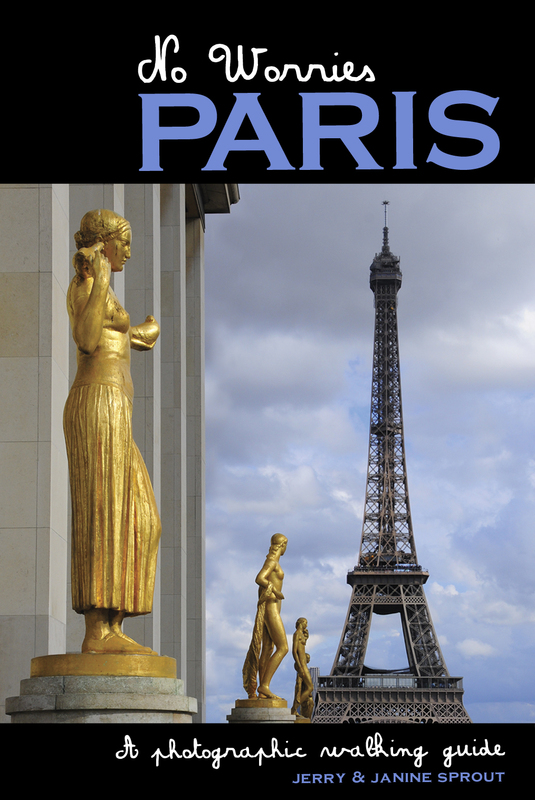 I was met by charming, effusive Marianne with a contageous smile who gave me a complete tour. 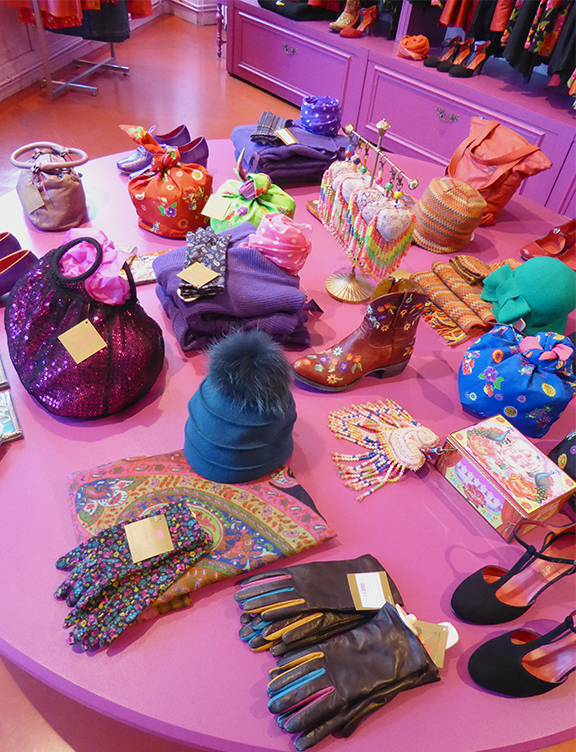 They produce two collections a year, winter/summer and the theme at the moment was Mary Poppins. The store takes clients on an imaginary voyage (their clothes travel well) and Marianne picked up a pair of blue laceup low-heeled shoes just like Mary’s to illustrate. Fabrics from France, Japan, India in rich colors and patterns dominate, the wrap dress being their signature item. Marianne said customers can come in wearing clothes from previous seasons and find that their colors still compliment. My “happy meter” kept escalating the more I conversed with Marianne, however, it was clear she needed to get back to business and help customers. 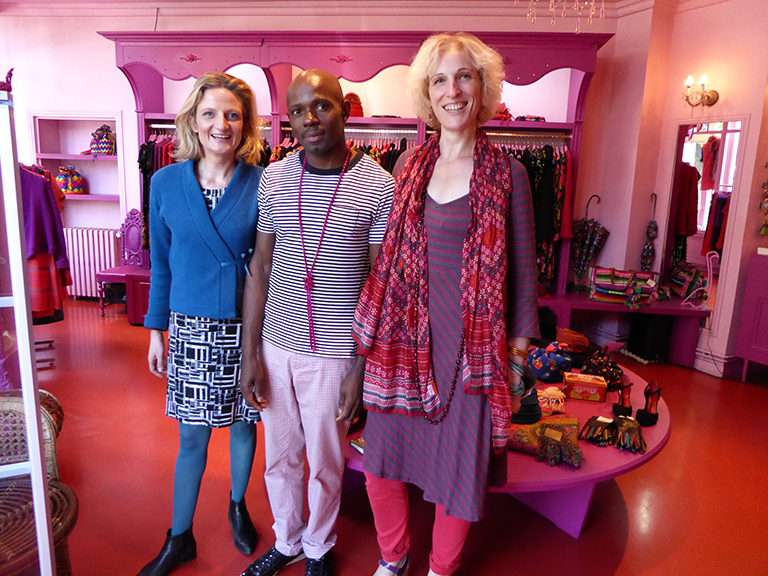 From left to right, Juliette, Albert and Marianne met me at the door to say goodbye…..their passion for what they do and their bon vivant personage connected us, tres bon visite. The yellow store is full of household decor, all nested artistically, all unique and fun. The merchandise comes from all corners of the globe. A place to pick up the perfect gift to brighten the home. Note: location is right on the romantic St. Martin canal where the movie Amelie was shot. 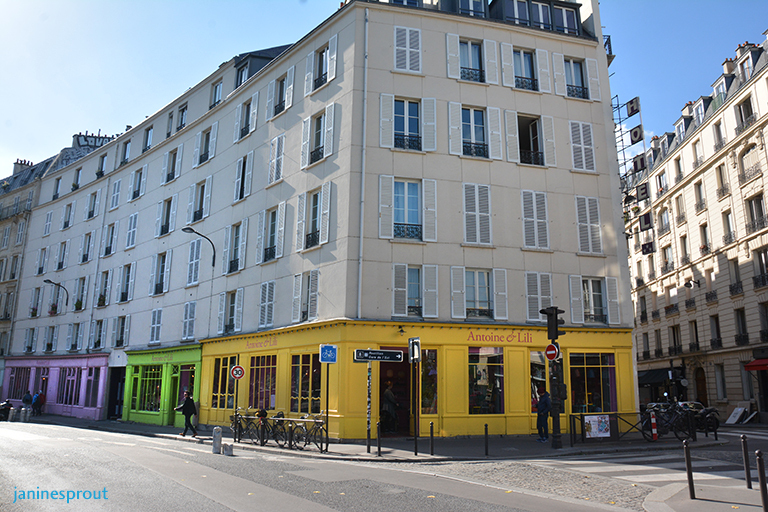 95 quai de valmy, 75010, www.antoineetlili.com. For a list of all their stores go to their website.